(By our staff reporter) -The event was graced by the presence of distinguished celebrity guests - National Award winning Bollywood actress Ms. Neetu Chandra, popular TV host and of Emmy award-winning show Equitrekking - Ms. Darley Newman, Mrs. Taruna Chakarborty, distinguished community member as well as more than 150 members from across the tri-state area majority of them women. The event marked the annual International women day by honoring women and their resilience and perseverance. Distinguished women addressed the gathering and shared their experiences and struggles and what distinguished them and made them leaders. 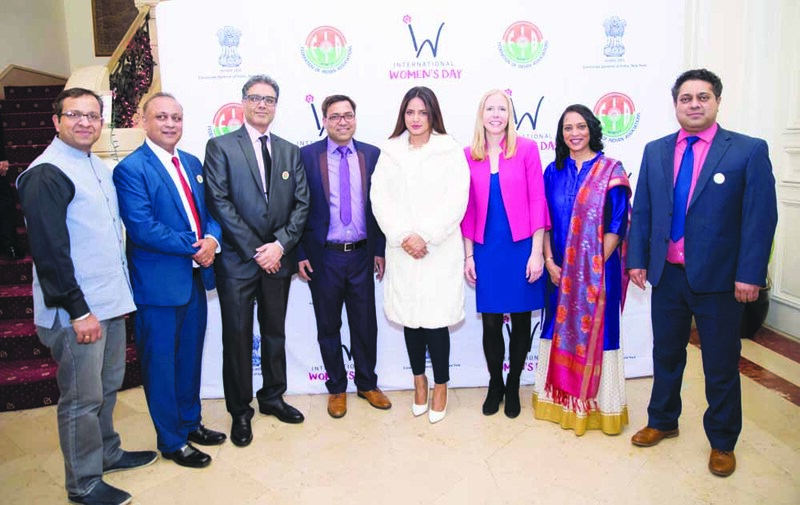 Consulate General of India, New York, Mr. Sandeep Chakravorty also graced the occasion and spoke about leadership in women and the need of equal rights. Mrs. Sukhminder Kaur, Mrs. Sheetal Trivedi, Mrs. Arun Anand, and Mrs. Rina Shah were honored by the consulate general and FIA committee for their distinguished achievements and contributions to the society.FIA president Mr. Alok Kumar along with the FIA executive committee members, Chairman Ramesh Patel joined the felicitation of all celebrities, annual honorees including the all-women crew of Air India, along with Mrs. Bhouvna Rao, RM Americans for Air India.